Since 2011, B-sm@rk, an Italian-Irish company has been developing research and technology based on consumer behaviour and marketing automation for travel, hospitality and brands. Through MySmark, a customer experience platform, the company provides research and digital marketing tools for online travel and commerce. The cornerstones of the company are the Brand and Destination Personality (BP and DP) tools and researches. The personality of a brand or a destination is identified by a set of human characteristics associated with that brand or destination (This concept is more and more important in marketing since, as we all well know emotions matters). The concept serves as a connector between tourists, travel brands and places. It can be used to improve the customer experience and enhance revisiting intention and promotion behaviour. As a matter of fact, the tool can enable the tourist to search online for a good fit and book for his needs to optimize time and cost of a better experience, with as low effort as possible. How does all this information link to Chinese tourists? As a matter of fact, outbound tourism is growing at a stunning pace (Chinese outbound travel is expected to grow from 135 million outbound trips in 2016 to 200 million in 2020 with a spending of US$460 billion) and it is quite still unknown since it is relatively new and it keeps changing. Very few in-depth studies are being made about Chinese tourists, and this is here that Brand and Destination Personality concepts gain importance, helping EU destinations to better understand and attract Chinese tourists. It is not a coincidence that the year 2018 has been declared the “China-Europe tourism year” as announced by the European Commission’s President, Jean Claude Junker. B-sm@rk seized the moment starting a new project of Brand and Destination Personality related to Chinese tourists visiting Ireland. This project focuses on profiling Ireland´s destination image from Chinese tourists’ point of view, and targets some tailored actions and optimization with regards to the customer experience for this audience of tourists in Ireland. Surveys about Brand and Destination Personality has been provided to the main audience of the study, which is composed by tourists, students, and residents in Ireland (the data have been collected both on the field and on various social networks). It targets four main destinations in Ireland: Dublin, the Wild Atlantic Way, Ireland’s Ancient East and Northern Ireland, and includes a specific focus to one of the Chinese tourists preferred stop, the Guinness Storehouse. It was possible to measure some key insights of the destination identity using the DP and BP scales, which contains traits such as responsible, active, aggressive, simple and emotional. Moreover, the “Big Five model”, also called “OCEAN model” has been used to assess tourists personality and run some interesting analysis combining human, brand and destination personality. From the main data, it was possible to infer that Chinese people who actually visit Ireland are, on average, young (21 – 40). People who visited Ireland gave different scores on the scales comparing them with the people who never visited Ireland; the results show indeed that they are characterized by different behavioural attributes. 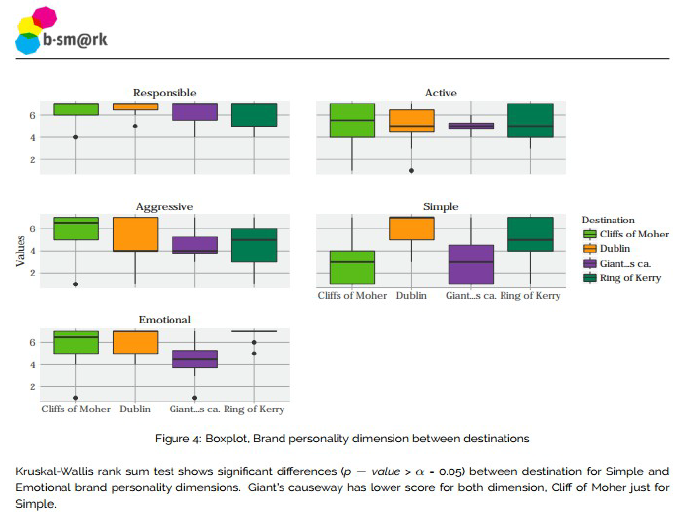 The image above shows how Chinese sample audience of the research is perceiving differently the key tourism itinerary of Ireland, as highlighted by the scores given using the Brand Personality scale (note that value range is 1-7). Though the project is still in progress and brings some experimental angles to the analysis the company is planning further analysis to further dig into visitors’ behaviour, so that to augment the understanding of the Chinese visitor in a pilot destination of Europe. European tourism would benefit from attracting more Chinese travellers, however, if Europe wants to fully capitalize on the Chinese market, it will have to get smart fast and it will need to find new sources of sustainable tourism growth.